Delivery from £5.00 to United Kingdom in 2 - 5 working days. This Denver Floor lamp is a high-quality, innovative, modern lighting solutions. 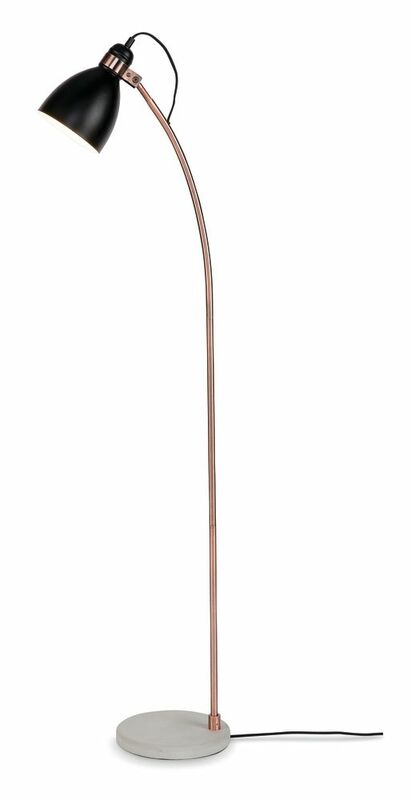 This floor lamp is made from high-quality iron with a cement base, copper stem, and fabric cable resulting in contemporary charm for your home or commercial space. it's sleek and stylish design is weighted by a robust cement base with metallic copper stem and iron lamp head. This lamp is a unique interpretation of the industrial style. It is perfect for high attention spaces such as your living room, hallway or kitchen with its curved stand ensuring that it will fit into and light up any space.